I’m taking a Southern literature class right now–“The Rough South”–and last night while reading my last novel for the course, My Drowning by Jim Gimsley, I began to crave biscuits and gravy. This isn’t the first time. Over the course of this semester, thanks to all of the lovely biscuit filled southern lit I’ve been reading, I’ve made approximately 10 different biscuit or gravy recipes. I have a serious problem. But after the word biscuit is used twenty times in two chapters, one has to make biscuits–even if it’s 11 pm. Even if one should be sleeping. Even if one hates Southern food. My god, this is a comfort food thing…well, even though my family never made biscuits and gravy. I was hungry, watching the fire, wishing for something to eat. We would have biscuits soon, I could smell them, but I never ate fast enough to fill my stomach, and afterward there was never anything left over. So I huddled in Mama’s lap and watched the fire and felt the hollow fist in my belly. The smell of biscuits filled the house, drawing my brothers, Carl Jr., Otis, and Joe Robbie, slouched like dogs along the walls. The smell awakened Daddy, who shuffled from teh bedroom pulling a flannel shirt over his thin shoulders. He spooned sugar into his coffee and said nothing. When nothing but biscuit appeared to eat, he stared into the top of the table. He chewed the biscuit as if he were grazing in a pasture. I got half a biscuit. The sensation of warm bread in the stomach made me happy, and I was allowed to eat in Mama’s lap. We were eating, all of us. We crowded near the fireplace. No one talked. To make the biscuits, mix the soy milk and vinegar in a seperate bowl and allow it to sit for 10 minutes until fermented. Mix together dry ingredients in a large bowl. Cut the margarine into pea sized pieces (in the flour) with a pastry cutter or fork. Add liquid ingredients and mix with a fork until it just starts to come together. To make the gravy, saute the onions and garlic in the vegetable oil for 2-3 minutes. Add the flour and stir until a paste forms. Slowly incorporate the water, constantly stirring, until a thick but liquid gravy is formed. Add the salt, pepper, and sage. Allow the liquid to boil for 3 or 4 minutes. While the liquid is thickening, saute the mushrooms in 1 Tbsp of olive oil until slightly cooked. Add the mushrooms to the gravy as soon as the gravy has thickened. This is one of those foods left behind when my husband and I became vegetarians and he mourns it… I’m making this for dinner tonight!!! 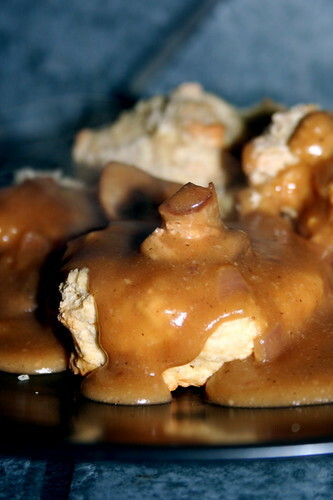 I can’t tell you how excited I am to stumble onto this post – gravy (especially with biscuits) is one of the few things I miss from my meat eating days! I can’t wait to try it!